Luoshe, a town with a population of less than 20,000, has more than 60 piano factories, and over 50,000 pianos were produced there in 2017. A piano factory in Luoshe Town. It is rare to see farmers playing pianos, but even more rare that in a small town in east China's Zhejiang Province, farmers can earn a fortune making pianos. Local villagers started making pianos more than 30 years ago. After China's economic reform and opening-up policies were adopted in 1978, people across the country were encouraged to start businesses. In 1984, Wang Huilin established the first piano factory in Luoshe. The farmer first decided to make toy pianos, but the idea to make real ones followed as he discovered many farmers in the town excelled in carpentry. Wang received support from the local government, which brought four piano technicians from Shanghai to the factory with a 10,000 yuan lump sum payment (about US$1,580), and tripled their month salary to over 200 yuan. But making a piano is nothing like making toys or furniture. Under the guidance of the four experienced technicians, it took the farmers four years to make their first piano, then Luoshe started to fine tune its development. "A piano is composed of more than 8,000 parts and requires over 300 procedures make it, but we have mastered them all," said Jin Wenying, who used to work at the factory. Farmers learned to build, polish, string, and paint pianos, becoming piano-making professionals, or some even taught themselves to play. When the market economy was taking shape in China in the 1990s, many started their own piano-making businesses, including Jin, who is now the director of Yueyun Piano Factory. Currently, every one in eight pianos in China are produced in Luoshe, with a piano industry output of about 250 million yuan. In March 2010, a grand piano was displayed at the Shanghai Expo. The piano, made by a piano-maker in Luoshe in just 33 days, was auctioned for 9.9 million yuan for charity in Beijing later that year, the highest price seen for a Luoshe-made piano. 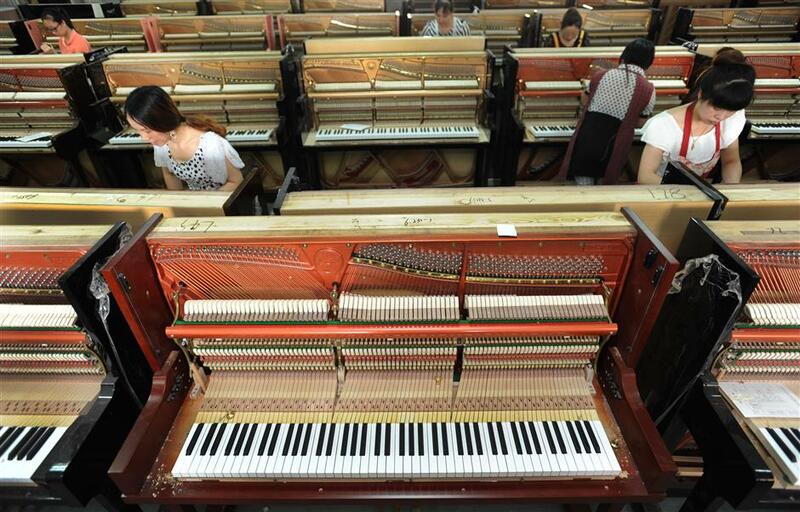 The pianos are exported to more than 10 countries and regions, and the town is the largest piano-making base in China's Yangtze River Delta region. International brands, such as K.Clara from Austria, have also opened production bases in Luoshe. Many of the villagers still work in the fields during sowing and harvesting seasons, and their traditional lifestyle of farming and fishing is now accompanied by music.